In this article we will see how to display multiple months in jQuery DatePicker. jQuery DatePicker in default behaviour shows dates for single month. We can make DatePicker to show dates for multiple months by setting numberOfMonths property. The property accepts integer value. We have created our ViewModel. We have a DOB property of type DateTime. 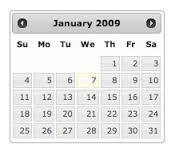 The View will bind to this ViewModel and will generate control for this property which is our DatePicker. In the View the ViewModel is binded and the boolean property to show button panel is set to true. We need to include above jQuery script reference to make DatePicker work. Click inside textbox to open DatePicker. Thus by setting the numberOfMonths property, we can display multiple months. We have supplied 3 to this property in the above example. On clicking the textbox we will see dates of 3 months.